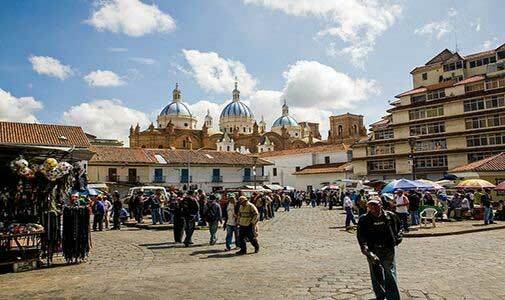 If you retire in Ecuador, every cliché you’ve heard about living large on little money–about settling into the lap of luxury on even a pensioner’s budget – is true. This is one of the world’s most affordable places to live. Take $450 out of the ATM Monday morning, and your expenses are covered for the week. Of course, low prices alone do not make for an ideal retirement or investment destination. There are plenty of places the world over where you can buy cheap land, but you wouldn’t want to live there; not so in Ecuador. In Ecuador, not only can you retire on little money, you can also live very well. Retirement in Ecuador offers something for everyone, and at prices unheard of in North America and Europe. Indulge in a gourmet meal in a world-class restaurant. Why not? The cost is about what you’d pay for bottled water and an appetizer in a restaurant in Los Angeles or New York. Plus, the fresh fruits and vegetables you find overpriced at specialty “organic” shops up north sell at local Ecuadorian markets for pennies. It’s hard to pinpoint the best reason for retiring to Ecuador, but one thing’s for sure: this is an affordable and beautiful retirement destination. Ecuador also offers a high quality of life. This is no isolated backwater. It’s a land of opportunity, where a middle class is forming. After waking from a long economic slumber, Ecuador is preparing to join the global economy. Recently, for example, the new Mariscal Sucre International Airport opened just outside Quito. It’s very impressive, with plenty of immigration and customs stations. No more congested baggage claim area, and plenty of restaurants and shops. From snow-capped volcanoes to dense Amazon jungle, from sun-drenched Pacific beaches to the famous Galapagos Islands, this is a place of astounding natural beauty. Despite covering a mere 0.02% of the world’s landmass, it is home to 10% of the world’s plant and animal species. This country’s real treasure, however, is its people. Ecuadorians live their lives in jungle river towns, coastal fishing villages, isolated cattle ranches, the grounds of ancient haciendas, and large colonial cities. Its compact size makes it possible to experience many of these different lifestyles in a single day. It’s also one of the few places where a foreign resident or visitor can blend easily into the community, being welcomed into a new circle of friends and a new way of life with relative ease. As a foreign retiree in Ecuador, you’ll be treated with respect, and the people will be eager to get to know you. During the last decade, Ecuador has gone through a number of tumultuous changes. Nevertheless, today the country has emerged as a welcoming haven for those wanting to retire or invest here. The property market is on the rise, but you can still find bargains. A comfortable lifestyle can be enjoyed in Ecuador on just a fraction of what you’d spend in many parts of the world. And remember: Ecuador is one place right now where the U.S. dollar is not losing value, which makes an Ecuadorian retirement especially appealing. Following the late-1990s’ debt default, Ecuador decided to adopt the U.S. dollar as its official currency, which eliminates currency risk. Inflation is 4% and most economic indicators are positive. Labor costs are still a tremendous bargain and are not rising appreciably. It’s not just properties that are affordable in Ecuador – nearly everything is. From the cost to hire a full-time maid to the price of produce and dinner in a fine restaurant, you’ll be surprised at how low the cost of living is in Ecuador. For example, in the major cities like Quito, Guayaquil, and Cuenca, you won’t have to forgo First-World conveniences. New cars abound. Everyone has cell phones, and Internet connections are just as common. World-class restaurants serve excellent meals, yet you’ll be hard-pressed to pay more than $50 for dinner for two–drinks included. It’s easy to retire in Ecuador on less than $20,000 per year, and you can live a comfortable lifestyle while doing it. Many foreign residents have their main home in the city, and also have a country home, a beach property, or even property in another country…a feat that would be impossible on a comparable living in the U.S. Additionally, this low cost of living allows retirees the ability to increase their travel, own nice things, or partake in other diversions. If you’re 65 or older and looking for an incentive to retire overseas, take a look at what Ecuador can offer you. Ecuador’s constitution guarantees foreign residents the same rights as their citizens, so you can enjoy the same benefits as locals. …and much more. The Constitution also states that abandonment or mistreatment of the elderly by relatives or institutions is punishable by law. 50% off public and private transportation within the country (including the Galapagos—by the way, just having a National Identity card gets you a 90% discount on the park entry fee). 50% off tickets for all cultural and sporting events, including movies. A discount on electric and water bills. Free domestic landline phone service (does not include long distance and other services). Reductions in a variety of taxes, including a refund of your 12% IVA (value-added) tax up to $92.64 per month. Although not officially part of the government’s program, one of the most popular discounts for foreign residents is the 50% airfare reduction (airfare only, no discount on airport fees, fuel surcharges, tax, etc.) for international travel offered by airlines such as Avianca, Copa Airlines, LATAM, and Ecuador’s Tame. All offer flights to the U.S. as well as other countries. The discount applies to round-trip tickets purchased in Ecuador for flights originating within the country. You also must purchase the tickets in person at one of their ticket counters or with a certified Ecuadorian Travel Agent, to present verification of age. The discount is available to all citizens and residents over the age of 65. The cherry on top of retiring to Ecuador is that citizens and residents over 65 won’t waste a lot of time standing in line. If you’re a senior citizen, when you make a bank deposit or pay your utility bill, you will find there is a special line for “tercer edad.” Likewise in grocery stores, but even if there is not a special line, you may just go directly to the head of the line…so you’ll have more time to relax and enjoy your retirement in Ecuador. When my wife Cynthia and I were looking for places to relocate abroad the choices seemed overwhelming at first. It’s a big world out there, after all, so we decided to make a list of what was most important to us. The field quickly narrowed when we realized the importance of being reasonably close to, and staying in touch with, our family. Asia sounded intriguing, but was just too far away. The thought of living in Europe was stimulating, but with the five-hour time difference we knew communication would be problematic. Latin America offered the most possibilities to satisfy our wish list, and through research with International Living we discovered Ecuador, a small South American country that at the time we couldn’t have pinpointed on a map. More specifically we read about Cuenca, the country’s third largest city, which not only had we never heard of, but whose name we didn’t even know how to pronounce. Yet something about Cuenca seemed to speak to us, so much so that we booked an investigative trip in July 2009. We were thrilled with what we found and moved to Cuenca in May 2010, happily living here ever since. As I’m writing this it’s July and I just finished speaking with our daughter on Skype. She was talking about her parched lawn, high utility bills, and sweating bullets. Six months from now we’ll be chatting about shoveling snow, high utility bills (again), and bundling up. Here in Cuenca the sun is shining, the flowers are blooming, and the temperature is in the mid-70s F. When we have another conversation next January I’ll be experiencing the same thing. It’s “winter” for us now, so the evenings can be cool on occasion. It’s also our “dry” season, but that only means it rains less often. Year-round the foliage remains lush and green. Since we don’t have (or need) central heating and air, our monthly utility bills remain constantly low. Work—chores—errands. I’m describing our previous lives in the States, but I’m guessing you can relate. We lived with so much stress, from daily rush hour commutes to constant deadlines and schedules, to financial worries. Funny thing is, we didn’t realize this until we moved to Cuenca and escaped all that pressure. Now we find ourselves immersed in a culture where family is more important than career. Where if something doesn’t happen today maybe it will tomorrow. This can admittedly be annoying at times when you believe something really needs to happen today, but you learn to go with the flow and are often pleasantly surprised that maybe your important something wasn’t such a big deal after all. Our relaxed way of life doesn’t mean we’re idle. On the contrary, our overall fitness level is better than it’s ever been as we walk almost everywhere in town and generally focus more on our exercise and diet. It helps that our markets overflow with non-GMO fresh fruits and vegetables. But the biggest surprise of moving to Cuenca has been our often overly active social life. Expats here find that they now have the time to form and nurture deep and meaningful relationships. From our experience, such friendships add immeasurably to one’s quality of life. We love the U.S. and visit our family often; but we simply couldn’t afford to enjoy our retirement years there the way we had envisioned. In Cuenca our life, while not lavish, is filled with wonderful amenities—a weekly housekeeper, eating out whenever we like, memberships at the gym and yoga studio, and fresh flowers throughout our beautiful two story, penthouse apartment. All of this is easily paid for with our Social Security checks. In fact we have money left over to travel throughout Ecuador and beyond. We would have never believed it possible, but we find ourselves living an overall better lifestyle here for a third of our monthly budget back in the States. You’ll have your own reasons for wanting to move or retire outside the U.S.—and there are an ever-growing number of places around the globe that may make better sense for you other than Ecuador. But for Cynthia and me, Cuenca has been a beautiful and affordable place to call home.